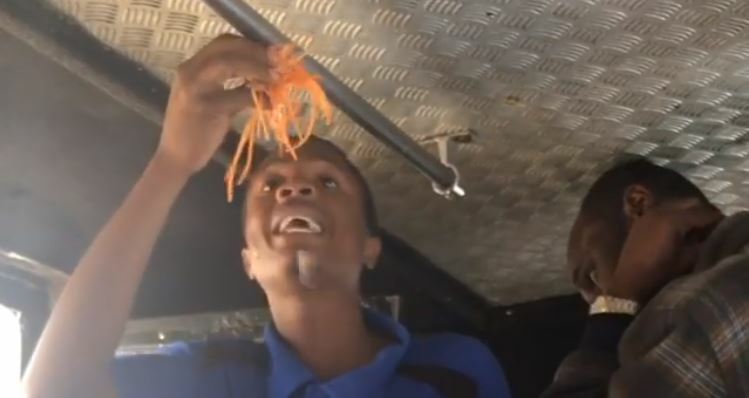 Video footage has emerged online showing a resourceful Kenyan earning an honest living as a hawker in a Public Service Vehicle. While seeing hawkers and sometimes men of the cloth in Matatus is not anything new to most Nairobi commuters, this particular merchant is earning admiration from Kenyan netizens for his impeccable marketing skills. In two videos shared online, the enterprising hawker is seen marketing kitchen utensils in a moving matatu in the CBD. The ingenious hawker, backed by his flawless oratory skills in Swahili and a refreshing sense of humor, showcased a passion and zeal for his job that left Kenyan netizens wanting to buy his stock. “He made me buy this thing and I have never used it!!!! Best marketer lol,” another added. We understand that he is popular among commuters plying the CBD-Eastleigh route.